Damon Lamon Stoudamire was born in the 3rd September 1973, in Portland, Oregon USA, and is a former basketball player who spent 13 years in the National Basketball Association (NBA), playing for such teams as the Toronto Raptors, Portland Trailblazers, Memphis Grizzlies and San Antonio Spurs. After he retired in 2008, he started a coaching career, and currently serves as the head coach of the men`s basketball team of the University of the Pacific. Have you ever wondered how rich Damon Stoudamire is, as of late 2016? According to authoritative sources, it has been estimated that Damon`s net worth is as high as $46 million, an amount earned through his successful career as a basketball player, and more recently as a basketball coach. Damon is the son of Liz Washington and Willie Soudamire; his parents lived in an extramarital union, and he was their only child, until Willie moved to Milwaukee, Wisconsin, as he got hired in a brewery when Damon turned seven, and Damon was subsequently raised by his mother and paternal grandmother Wanda Stoudamire-Matthews. From his early days, Damon was involved in sports, mostly basketball and football, encouraged his uncles Charles and Anthony Stoudamire. Damon eventually chose basketball as his primary sport, and soon improved – he went to the Woodrow Wilson High School, where he played for the school`s basketball team which won the state championship in 1989 and 1991; he averaged 26.1 points, 9.2 assists and 3.6 rebounds in his high school career. After matriculating he enrolled at the University of Arizona, while he also earned a scholarship to attend University of Oregon. During his time at Arizona, he was named Pac-10 Player of the year in 1995, and was also named three times into the First-team All-Pac-10, consecutively from 1993 until 1995. After the successful 1995 season, he declared for the NBA Draft, and was selected as the 7th overall pick by the Toronto Raptors, which marked the start of his professional career and his net worth, as he signed his first professional contract. He immediately showed his talents, joined the starting five, and played in 70 games in his rookie season, averaging 19.0 points, 9.3 assists and 4.0 rebounds per game. He set the record of 133 3pt baskets by a rookie, and at the end of the season was named as the rookie of the year, and MVP in the Rookie All-Star Game. Following his retirement, he got the job offer to work as director of player development for Rice University men`s basketball team, before in 2009 becoming a stuff member for the Memphis Grizzlies. Two years later, his net worth increased when he joined the coaching staff of the University of Memphis, and its Tigers men`s basketball team. However, in 2013 he left Memphis and joined the coaching staff of the Arizona Wildcats men`s basketball team. Most recently he became the head coach of the Pacific Tigers men`s basketball team, which also increased his net worth. Regarding his personal life, Damon has been married to Natasha Taylor since 2006. 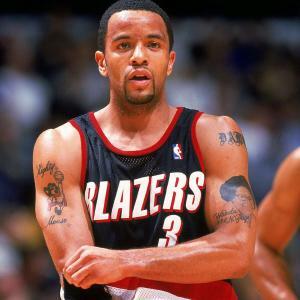 During his life, Damon had several problems with substance abuse; during 2002-2003 season, Damon was arrested alongside Rasheed Wallace for driving under the influence of marijuana, while also charged for speeding. Also, he was arrested two more times for marijuana possession, and as a result he was suspended from the team for three months, and underwent a 90-day rehabilitation program. 2 7th overall pick by the Toronto Raptors in the 1995 NBA Draft out of Arizona. Played for the Raptors (1995-1998), Portland Trail Blazers (1998-2005), Memphis Grizzlies (2005-2008), and San Antonio Spurs (2008). 1995-1996 NBA Rookie of the Year.